"Helena Petrovna Blavatsky (Russian: Еле́на Петро́вна Блава́тская, Yelena Petrovna Blavatskaya; 12 August [O.S. 31 July] 1831 – 8 May 1891) was an occultist, spirit medium, and author who co-founded the Theosophical Society in 1875. She gained an international following as the leading theoretician of Theosophy, the esoteric movement that the Society promoted. Fundamentally, the underlying concept behind Blavatsky's Theosophy was that there was an "ancient wisdom religion" which had once been found across the world, and which was known to various ancient figures, such as the Greek philosopher Plato and the ancient Hindu sages. . . . Blavatsky believed that all of the world's religions developed from this original global faith. 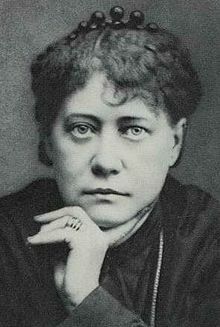 Blavatsky understood her Theosophy to be the heir to the Neoplatonist philosophers of Late Antiquity, who had also embraced Hermetic philosophy. She believed that the Theosophical movement's revival of the "ancient wisdom religion" would lead to it spreading across the world, eclipsing the established world religions. Thus, in bringing these Theosophical ideas to humanity, Blavatsky viewed herself as a messianic figure."